With the blockchain industry at fever pitch, a merry-go-round of puffed up conferences has left Jonathan Gagliardoni thirsting for a different formula. Speaking to CryptoSlate, the Token Forum founder and blockchain entrepreneur explained why the recipe for his upcoming conference catered to a more selective palate. 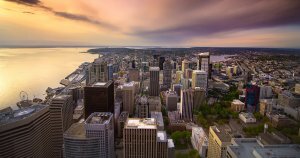 Kicking off Nov. 9 on the top level of Seattle’s Columbia Tower Club on the 76th floor, the second-ever Token Forum will once more look to cultivate blockchain’s most intimate networking environment in the unassuming tech stronghold of the Pacific Northwest. #Seattle’s @thetokenforum agenda is stacked with industry #professionals who will share their expert insights into #blockchain technology. See you #November 9th! When it comes to conferences, Gagliardoni would seem to have attended his fair share of thinly-veiled shilling extravaganzas. Yet the Seattle local, who also juggles his position as CPO and co-founder of decentralized loyalty startup EVERY, explained that the Token Forum was in some ways born out of his “tiredness” of all the “hype”. It shouldn’t raise eyebrows that the Token Forum maintains a strict, ‘no plugging one’s products’ policy at all times with the whole act being “less than 10 percent” about companies”, Gagliardoni assured. Presumably, such sterility is a prerequisite to achieving the forum’s ultimate mission—to build a breeding ground for the industry’s most elite networking opportunities—one that weighs minds over marketing. How do we get really good people in the room, talking about really interesting things, and then facilitate the conversation? This approach apparently went down like a house on fire at August’s inaugural conference, with the “blockchain-fluent” characters the forum is pitched at likely having sat through their fair share of corporate ballroom affairs with obligatory “networking breaks” where one breaks the ice over house-brewed coffee and predicted fruit platters. But perhaps akin to Bitcoin, the Token Forum will cap off a highly limited supply of participants in order to drive value—in its case: high-quality connections and “intimate” conversations. According to Gagliardoni, attendees will be able to “co-mingle” and chew the fat with many of the conference’s speakers, including potent Bitcoin maximalist and Morgan Creek Digital Partner Anthony Pompliano, Civic Co-Founder and CTO Jonathan Smith, and Dragonchain CTO Paul Sonier. The post Pomp to Speak at Seattle’s Most “Intimate” Blockchain Conference Yet appeared first on CryptoSlate.